The work of Saul Stokes is always somewhat of an identity statement. His many substantial releases never fail to relate how he is feeling, in both heart and mind. Appealing to our intelligence instead of insulting it, their best moments have a delicate beauty that stays with you. 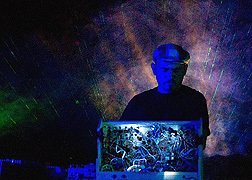 Stokes' whirring intellect again finds focus in the eight tracks of Local Crowd (62'45"). This wonderful album bridges and bounds the opposing energies of crude electricity and accomplished art, and aligns perfectly with the beat and pulse beneath and behind everything. The sensitive ear of the sincere listener will acknowledge the live, vibrant timbres present at every level of Local Crowd. Using the studio platform, Stokes is not arranging for the dance floor, but for the place in the mind where sensory detail becomes thought. Listening consciously to the sound we find that there are two moods, with drums and without. While the precious pastels of divided oscillators enrich the arrangements in several sonic specifics, they also dissipate the force of well-timed snare hits. Unexpected bass progressions, and other devices of drive, refine and soften the throb of rhythm. In a harnessing of the mind of the composer, the most imaginative and productive of arrangements are still to be used for the delicate, more tender moments found on Local Crowd. Blooming synth notes sustain just beneath the lead line in expressive tone colors and flights of imagination. Stokes' high vibrant main synth voice becomes fairly sparked with melody - as a harmless counter voice enhances the general mood of enjoyment. If we think of this music as electrical, a thing made of electricity, then we find it to be always remaking itself, changing in every instant, yet never changing at all. The limit of effect is merely the limit of the musician's imagination. 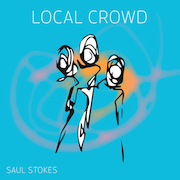 Versatile, alluring and inventive, with a fine ear for every novel discharge of the great modulators, Saul Stokes makes music for our time - and for all time.